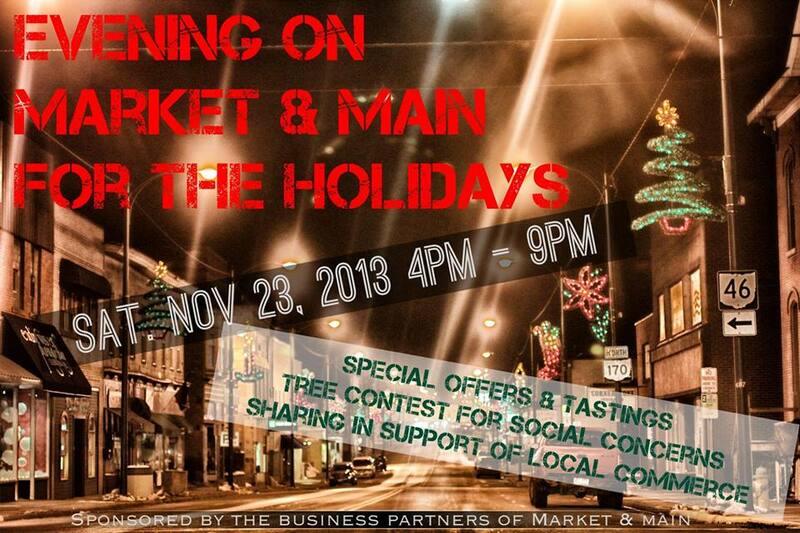 These store and shops are the heart of our town. See the store on the left (with the red awning). That is our local hardware store, True Value. Many of my crazy DIY projects start and end from a trip to the local hardware store. I love this store and the people that work there. They always seem to have what I need and willing to help. 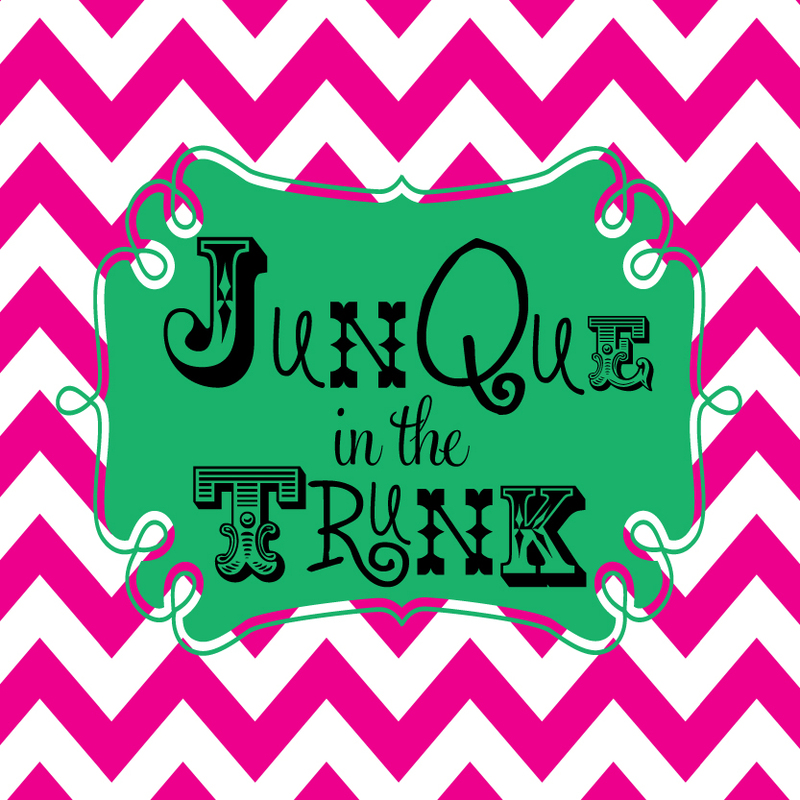 I buy most of my paints here, I am crazy obsessed with painting and repainting the walls of my house inside and out …. literally. We have lived in this house 2 years, I have painted every room at least once and in many cases 2 or 3 times. I buy all my sanding sponges and paint brushes and tools here too. I find there brand of paints and brushes simply last longer. We have many more stores and artist that make up this small town and I frequently shop these stores too, or get my midday latte to keep me going from the Coffee Stop . I will share what’s unique and special about these other stores in future post. 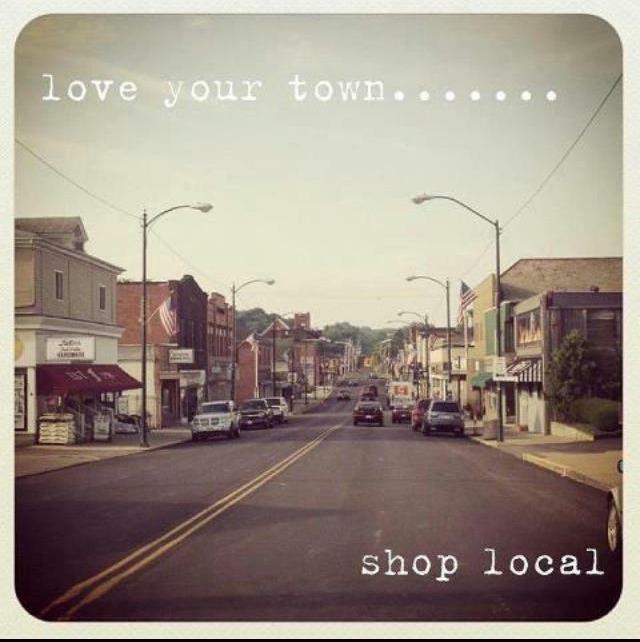 But for today I want to remind you to go see what your town has to offer ….shop local not only this holiday season but year round, you never know what you might find. Even if its not a store , there are many of us who are at our dining room tables creating and dreaming big into the wee hours of the night to bring you something special. 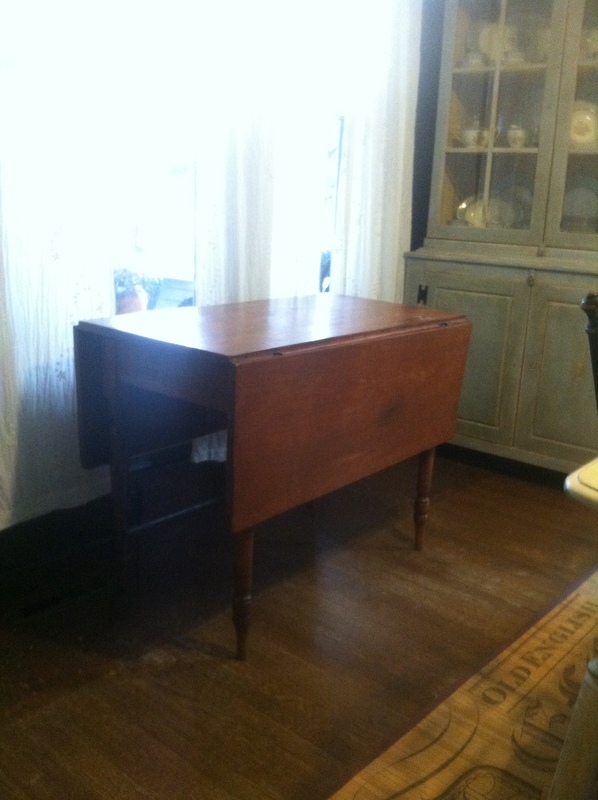 Last week I shared a picture of a beautiful old antique table my neighbours dropped off for me to make over for their home. 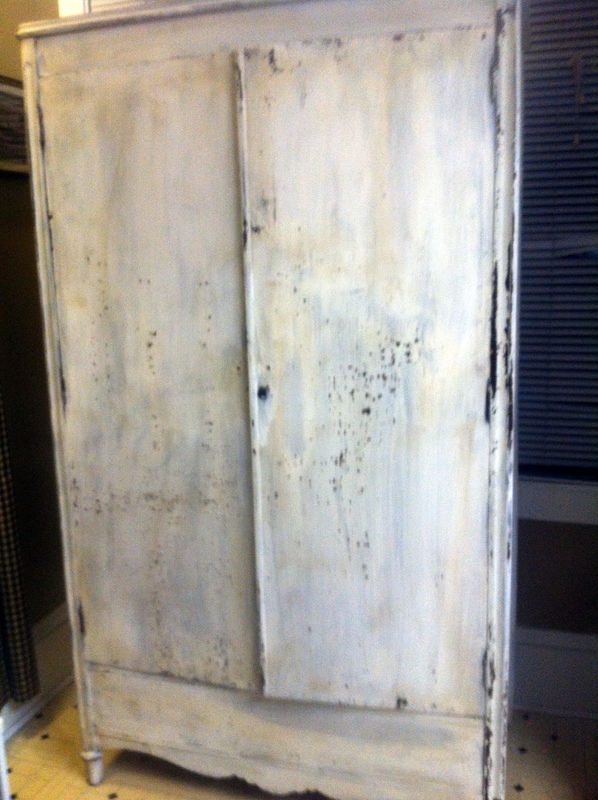 I used annie sloan chalk paint in old white for the top. I distressed with a sanding sponge and sealed with a clear coat of wax. 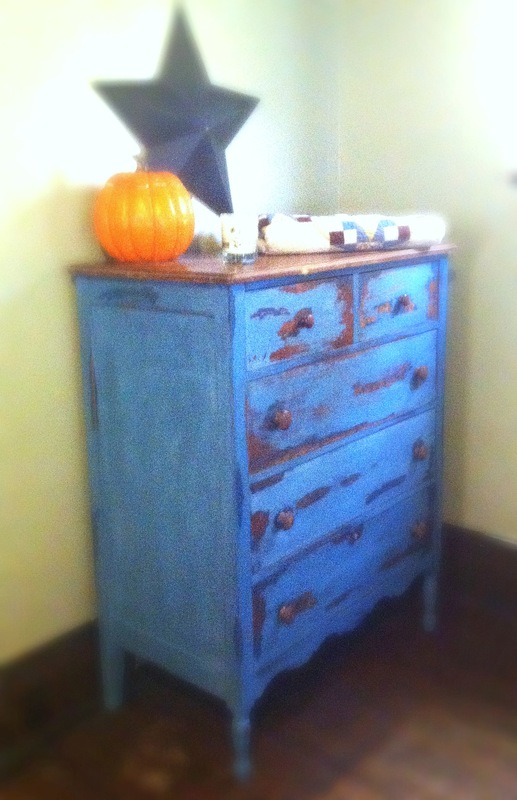 I wanted an old antique look so I also applied a coat of dark wax. When using wax , especially dark always use very little amount. I start on the edges and places I feel it would age more naturally and fan / blend into the middle. This looks more natural to me. My neighbour asked me how I knew exactly where to distress it and age the piece. I told her as silly as it sounds (insert pause here) I let every piece tell me a story. And see where it naturally happens. I do the same with my clothing designs and appliques. No two are ever the same. Each special and unique. 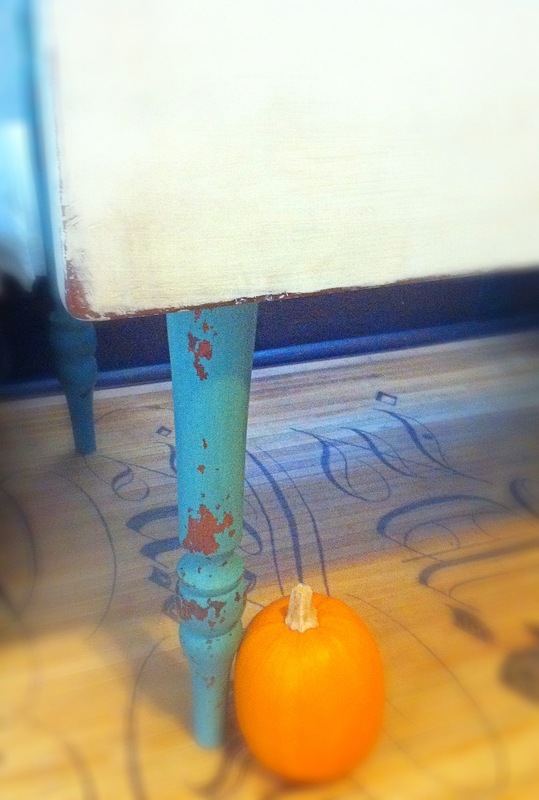 On the legs I used a custom mix I made from MMS milk paint. I mixed equal parts ironstone and boxwood. I mixed a 1/4 cup ironstone with a 1/4 cup warm water and let set a few minutes and then I mixed in a 1/4 cup boxwood with a 1/4 cup water. I mixed and let sit. I got the beautiful original color that is perfect for a “pop” of color she was looking for. 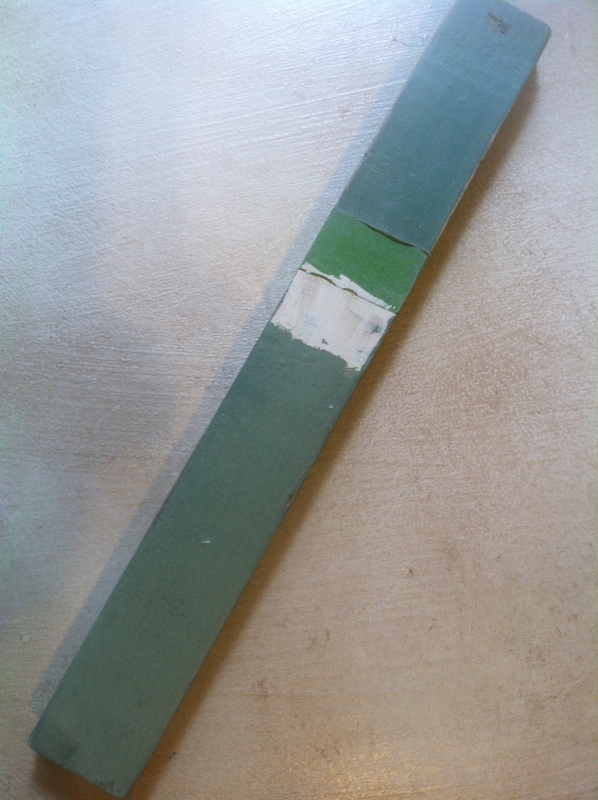 I love how this paint “chips” its always a surprise and so natural. She loved how the table turned out and is bringing me 4 chairs tonight , I will be sure to share. The very first thing I ever made over for my home were my grandparents dining room chairs. In those days I did everything in black , I have since discovered color and my tastes, and repainted most of my all black pieces but have left those, they were the first and are special. Last night my sweet neighbors showed up at my front porch with this. She loves the finish on my dinning room table. So I got my helper this morning . And we went to work. Snack and all. 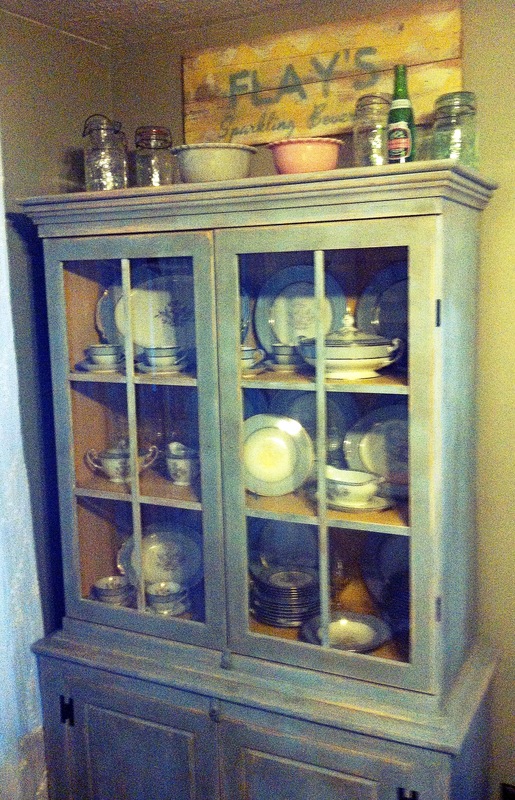 I used annie sloan chalk paint in old white for the top. 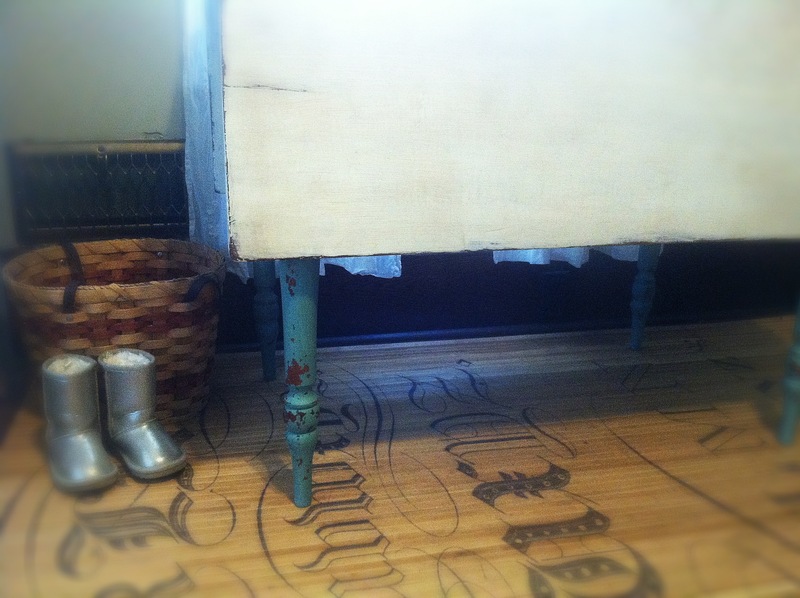 I am using a custom mix of mms milk paint I made for legs. Equal parts ironstone and boxwood. Just a little tip I learned the hard way a while back, mix the white (ironstone) first and then add the darker color (boxwood) . My test piece of wood. 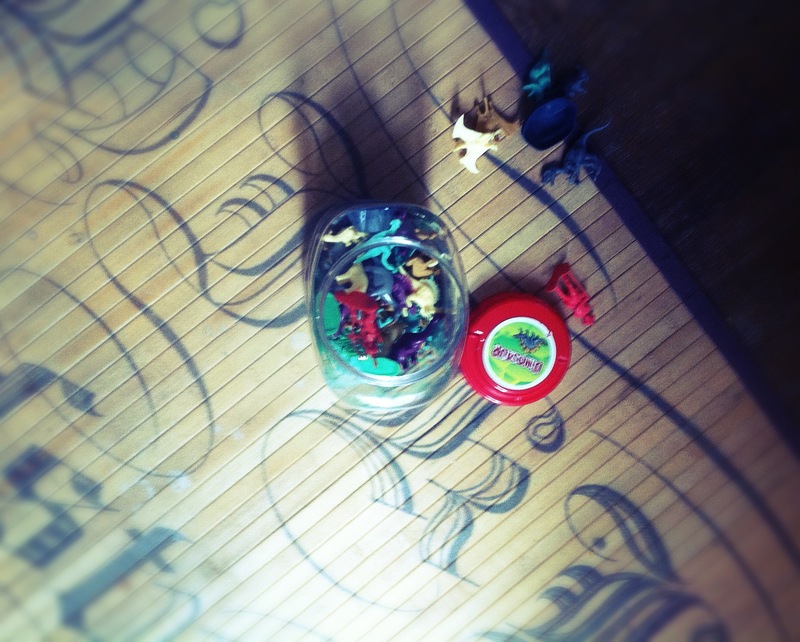 See the green frog tape, I am seriously obsessed with the stuff!! Use it all the time!! I only wish I had it when I did the diamond wall in the girls room this summer, would have saved me some time and frustration. I have the tabletop done and waxed. While picking up the toys and waiting for paint to dry I thought it would be a good idea to start on this …. here is sneak mid project. 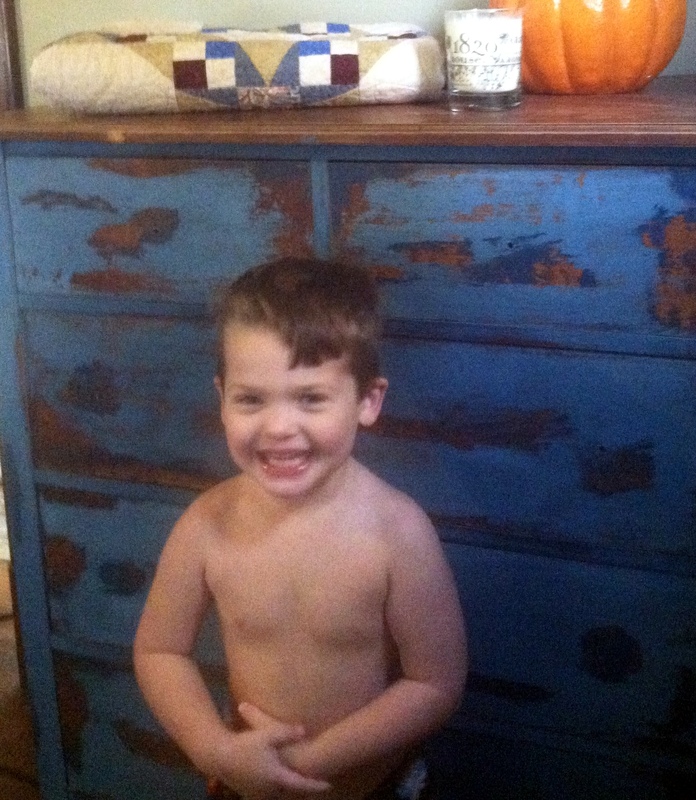 This is what what the dresser looked like when I received , a beautiful tigers eye maple wood. The piece was not perfect and needed a few minor repairs. But, the bones were great and made it a perfect candidate to be painted. I did not want to cover all the wood so I went for a chippy look. I knew milk paint could do its thing to help me achieve this look. 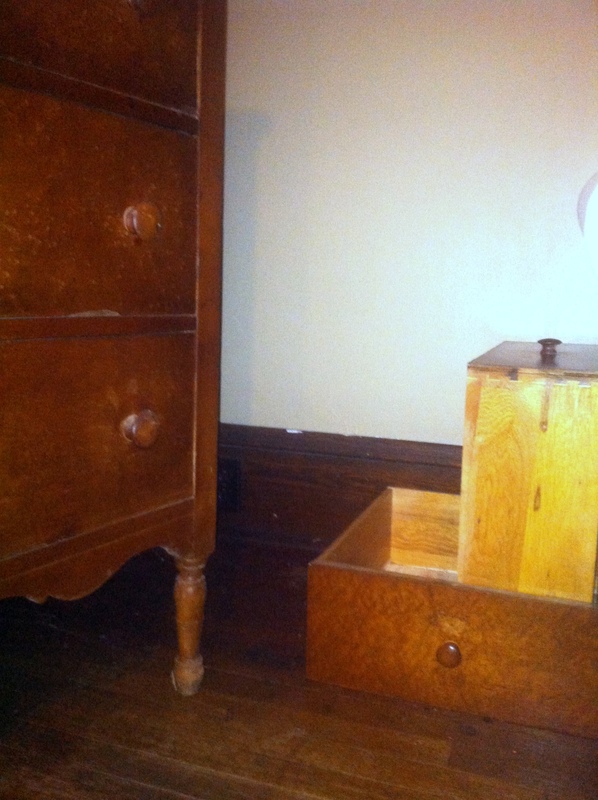 Since I want the wood more on the drawers exposed, I also used vaseline a deterrent. I have used vaseline before as a resistant so I knew what to expect and how to use it. I must advise this technique takes a little patience and practice. Its also a little gooey and messy. I used a bonding agent on the sides for the first coat. 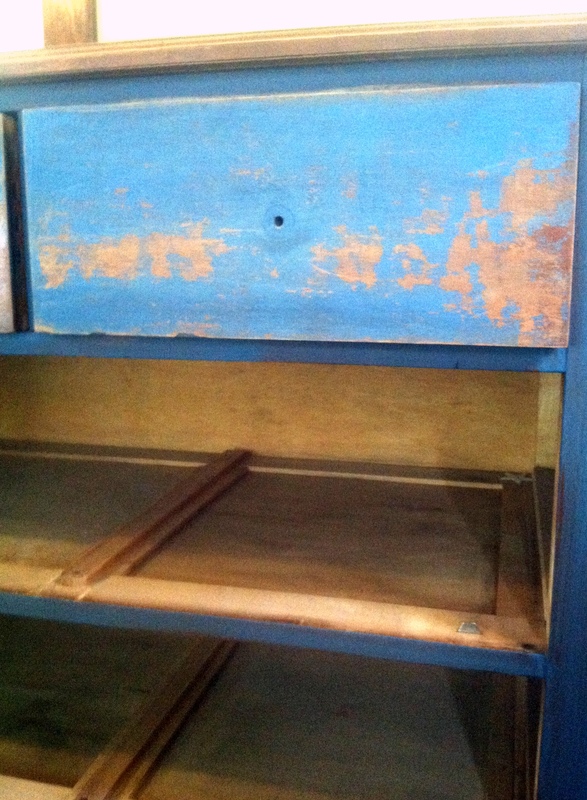 I layered the paint on the drawers using vaseline in between paint layers. I have talked about the “ugly stage” on Facebook but not on here. This is the part where you want to set it to the curb and start all over. Give it time and let it take shape. 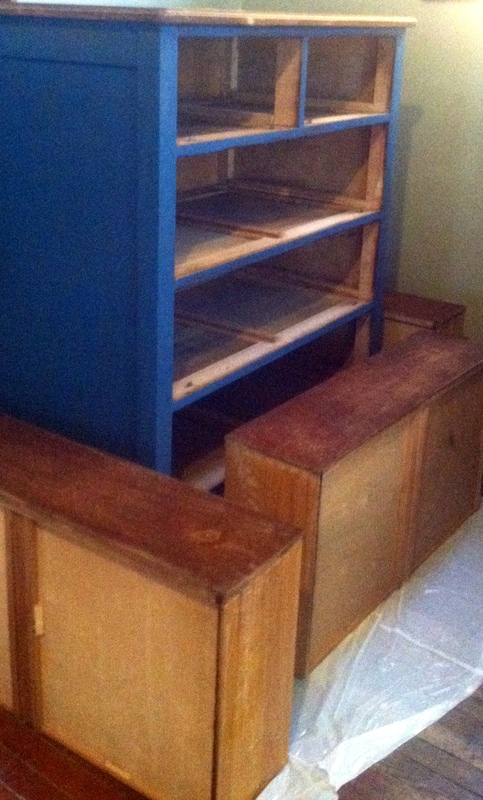 If you are using paints like milk paint you have to be open to each piece doing it’s own thing. 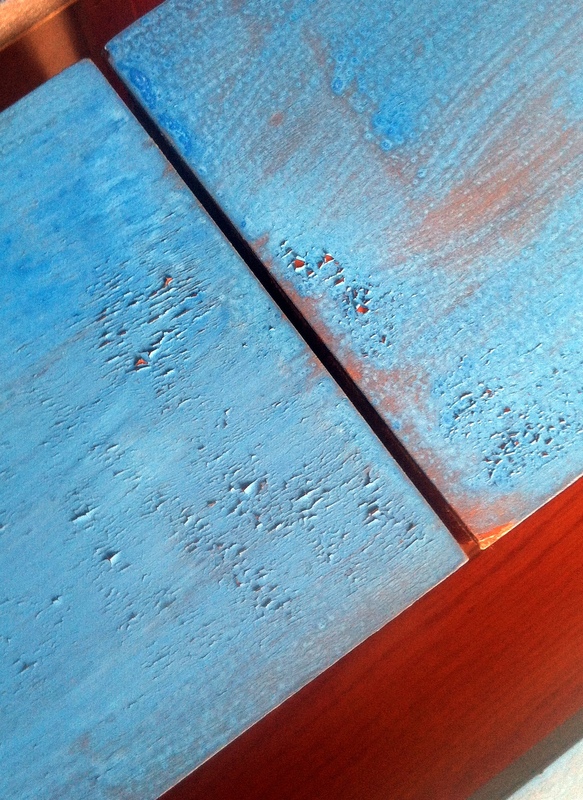 No two pieces are alike and the color varies depending on wood, texture etc. Knowing what you might expect comes over time with experience. Before it all comes together. I was seriously considering keeping this piece but I am open to selling it knowing it will go to a good home and be loved. But first I must decide what I doing with the top. 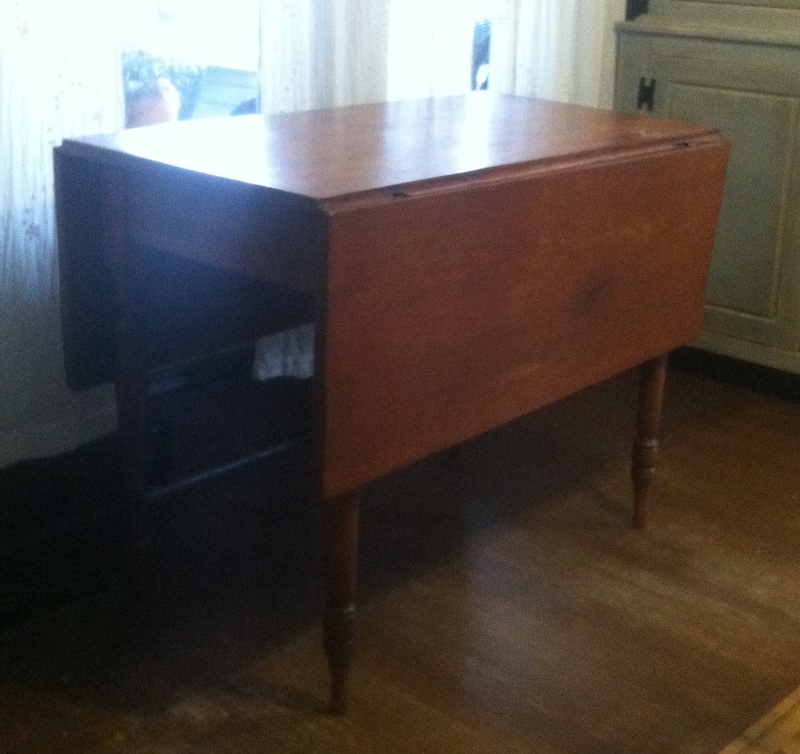 I was going to strip and stain but I love the natural aged look so I think I am going to clean and use some oil to bring back to life instead. I seriously need to invest in a camera, this pic doesn’t do this piece justice. I had some leftover paint from previous projects and been itching to make a sign for my house. 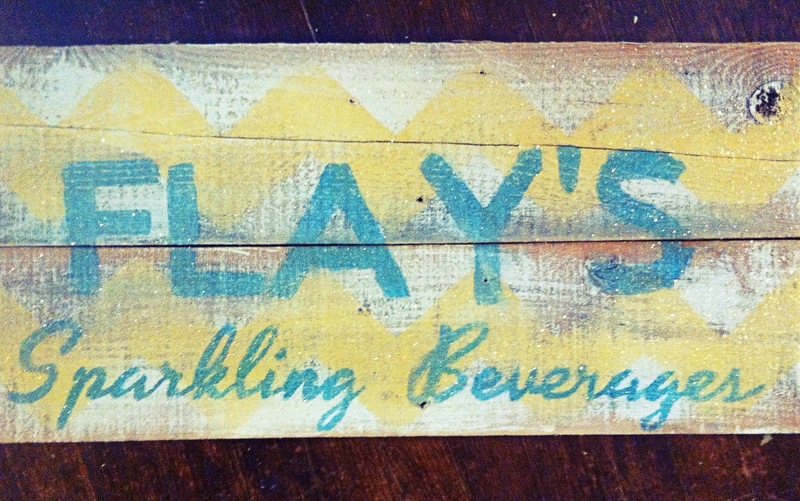 The idea for this sign came from the old Flay’s packaging on display at our local Library. Inspiration can come from anywhere at any time 😉 The color combo was perfect for that pop of color I was looking for and had the retro look I love. There is a special connection to my husbands family, my mother in laws grandmother was part owner for a while. My mother in law also has a great collection of the bottles and I have always admired them. So I found this to be fitting & meaningful for our home. 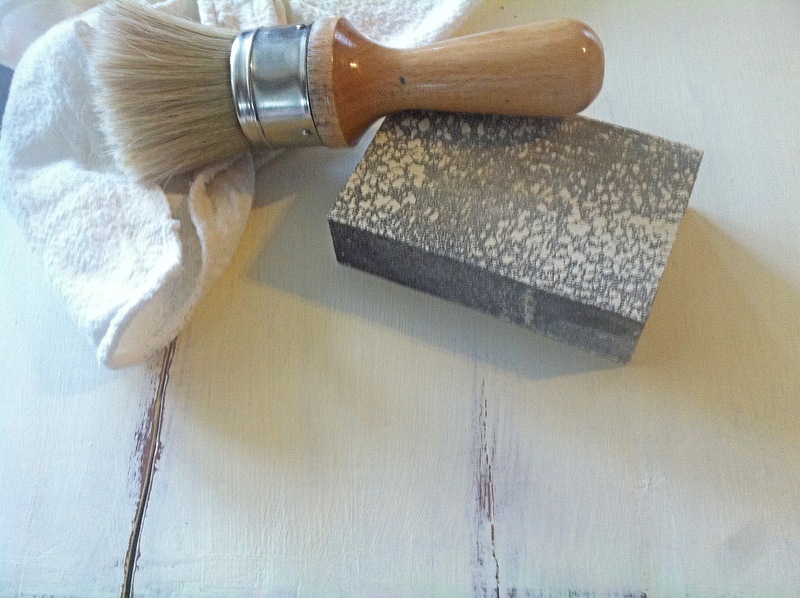 I started by dry brushing 3 pallet boards with left over old white chalk paint (annie sloan). 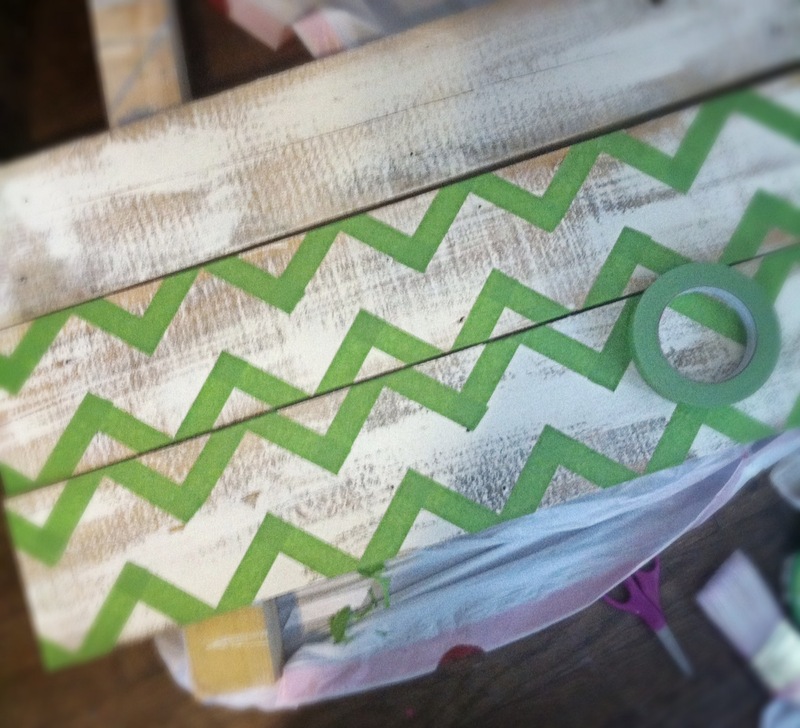 I then used frog tape and taped out a chevron pattern , they now have chevron painters tape if you didnt want to measure and tape 🙂 But I wanted mine to look more freehand and rustic. I ended up only using 2 of the boards in final sign and have one left over for another project. 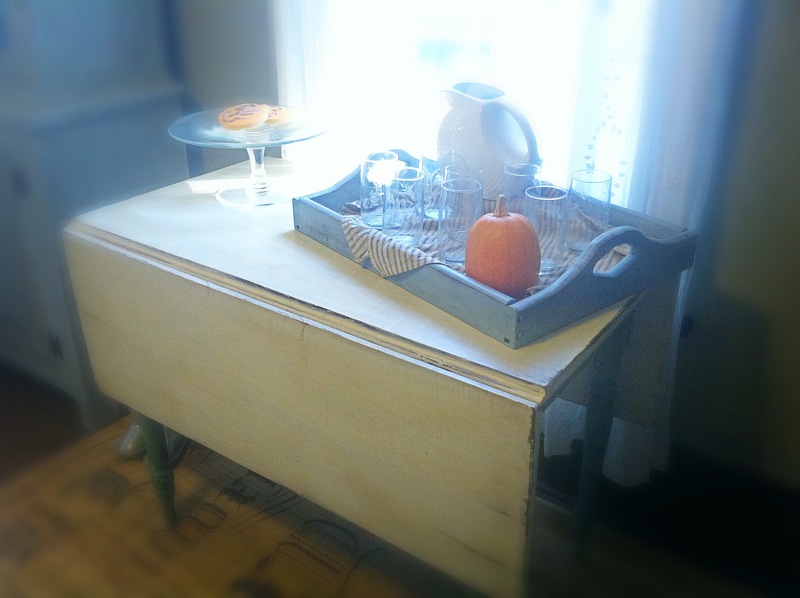 I next used mustardseed yellow (mms milk paint) I had leftover from my dining room hutch redo. 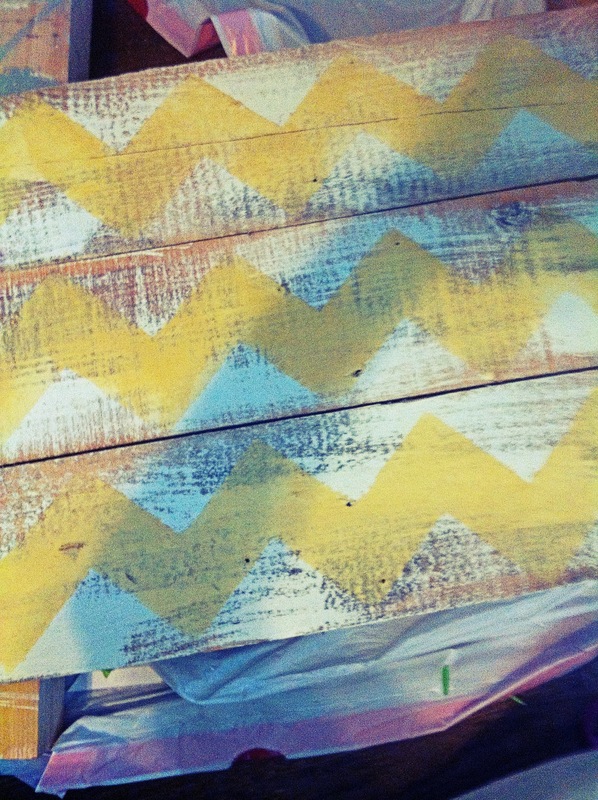 I painted the inside of the chevron lines and and before paint was dry I pulled off tape. and got crisp clean lines. I then freehand the FLAY’S lettering using some different colors of paint I mixed , I also love using acrylic paint for this too. There are few different techniques I use when doing different fonts like in the “sparkling beverages” I will share with you in another tutorial I am working on for later this fall. In part 2 of DIY signmaking. *I distress after the words are painted on, don’t be frustrated if you hate your sign before you distress it. This will give it a more authentic and aged look and blends it all together nicely. *add a little sparkle. I often use glitter spray paint over my signs, gives it that little extra. We are that small town ….